Northern Safety News & Information - Northern Safety Co., Inc.
On July 25, 2013, the National Institute for Occupational Safety and Health (NIOSH) announced it developed a unique new research tool to help ensure the proper fit of respiratory protection. NIOSH worked with the National Personal Protective Technology Laboratory (NPPTL), the Air Force Research Laboratory, and the Biomedical Advanced Research and Development Authority (BARDA) to create a talking robotic manikin head. This “talking head” is expected to provide opportunities to study respirator leakage that could expose wearers to harmful particles. “Development of this robotic headform was needed for these types of studies because older type headforms, which usually had hard surfaces or were covered only with a thin skin of plastic or rubber, could not form a good respirator seal to the face,” explained Ziqing Zhuang, Ph.D., a research team leader at NIOSH. The manikin is covered with a soft, porous material that resembles human skin. The head performs movements that simulate respirator fit test exercises. It also can recite “the rainbow passage,” a block of text that requires every possible movement of the human mouth. This will allow researchers to determine whether workers’ speech affects respirator fit and leakage. Another advantage of the head is it simplifies research by not becoming tired, changing weight, or requiring the clearance and review processes needed for human subjects. The initial fit evaluation by the talking head will focus on N95 filtering respirators. 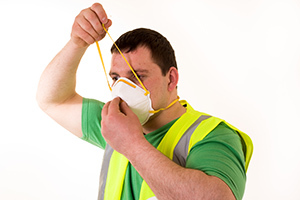 Respirators are an important part of many workplace safety programs. Protect workers by providing approved respiratory protection and thoroughly fit testing for the best possible seal.